The Gravity FSX 1.0 Dual Full Suspension Mountain Bicycle is designed with breath taking speed and superb looks. The bike delivers a top notch performance and is ideal for mountain bikers. It comes with a Shimano shifting technology with reliable components which has a proven track record of delivering fast, precise, smooth and seamless gear shifting experience. The 24-speed gear range of this bicycle is enough to handle varying terrain surfaces. The seat is ergonomically designed and easily adjusted which adds up to its smooth ride quality. It uses an aluminium frame with an advanced feature of CantiBeam Single Pivot Technology. The disc brakes which are quite powerful ensures efficient braking while the adjustable wide range Suspension fork system works well for absorbing shocks from bumpy terrain. 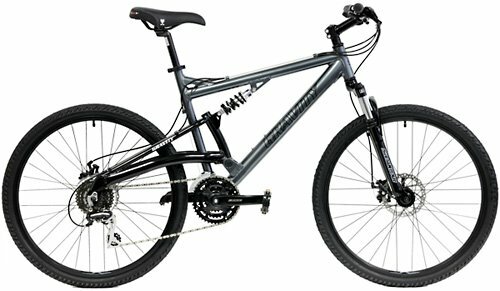 Fantastic entry level mountain bike with dual suspension. Front and rear disc brakes for greater braking power. High Quality and durable Shimano component with 24 Speed. Come in Yellow, white or Grey color with Black Rear Triangle color scheme. The Gravity FSX 1.0 Dual Full Suspension Mountain Bicycle is an entry level bike and ships with about 80 percent pre -assembled out of the box but it’s suggested you get a professional bike mechanic for final assembly and tuning which shouldn’t cost much. So far it has delivered awesome performance everywhere the bike goes. It doesn’t come with a kickstand so you have to deal with it leaning it on things everywhere you go or you can get a kickstand from your local bike shop if it’s really an upgrade you need. The rear suspension also does not deliver excellently as expected but other than these, it offers best bang for buck. The Gravity FSX 1.0 Dual Full Suspension Mountain Bicycle comes highly recommended to anyone who is starting out with mountain biking or just looking for a really sweet deal and looking for a reliable ride. You’ll be very pleased with it once you get over the price shock.